The tone of the evening was adequately set by Zebrahead, a band who had come recommended by MC Lars, coincidentally or otherwise, on the evening of the day tickets went on sale. 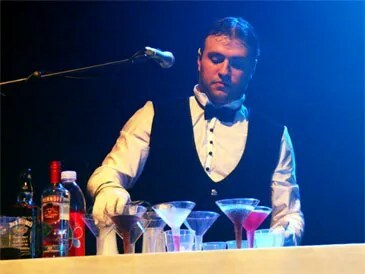 Rather than having the contents of their rider set beside instruments in anticipation, a full bar, complete with formally-suited bartender, sat at the side of the stage, preparing cocktails for consumption between songs. It was a high energy set from Zebrahead, which saw the audience constantly moving, even though it was not a large component of the audience out for this band in what could have been billed as a triple-headline show. Even those who weren’t too involved in the opener were able to join in for a girl-anthem medley of Avril’s Girlfriend, Britney’s Oops…, and a Limp Bizkit-esque take on Spice Girls’ Wannabe. Goldfinger were allegedly to follow, though it didn’t quite look like the traditional Goldfinger who came on stage: I’d been surprised earlier to spot Mike Herrera lurking around the side of stage, and he took up his bass, whilst Aaron Burnett made a pre-Reel Big Fish appearance on guitar. One of the bartenders fell into position behind the drum kit. Luckily, John Feldmann was front and centre, clad in his trademark suit and hat, and energetic as always. Songs like Mabel turned into massive sing-alongs, whilst Superman provided plenty of opportunity for crowdsurfing, including from John himself. We were even treated to an encore, including a cover of 99 Luft Balloons, with both English and German lyrics. Plus it was good to hear MxPx’s Mike backed by a horn section. When Aaron re-emerged on stage, he was wearing his Reel Big Fish uniform, the Hawaiian shirt and shorts combination we’re more accustomed to him in. Whilst some of the banter between songs seemed to drag a little, it was made up for with songs like Don’t Stop Skanking getting the entire house moving. The show ended, suitably, with a medly of alcohol-themed songs – Tequilla!, Red Red Wine, culminating in Beer, but sadly devoid of Drunk Again, whose gradual build would have made a fittingly grand (and logical) closer.